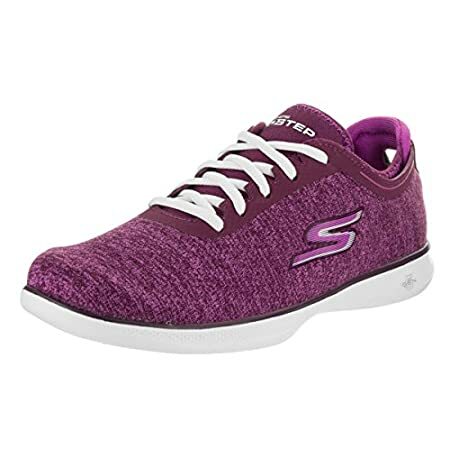 Not sure why you need to get Sketchers Performance Women’s Lite Agile walking shoe? Every one of us needs feather light shoes, that stays in shape for months, offer support and comfort, and allow an effortless experience while walking on any kind of surface on the ground. Right? So, how come it is impossible where there is a huge list of comfy, reliable shoes that fit best for walking and running? You must be aware of the fact that there is a range of different kinds of walking shoe that come up with certain comfort based features to help people walk better and easier. To make sure you are confident enough to have this Skechers Performance Go-step lite-agile walking shoe, let us have a deeper look into its features and benefits. This will help you understand how it can serve you better. Overall the shoe is a sleek and stylish shoe offering a professional design that matches the needs of all women who need to carry the shoes on while on the walk or for some reason they may also wear them on when they have a busy work routine. The shoe gives a comfy and stylish look and is available in 16 different colors so that you may choose whichever color you might want to wear on. The lace-up shoe gives a soft and easy to wear structure for easier use and user-friendly design. The upper of the shoe is flexible and is made up of porous fabric or mesh knit fabric allowing a soft comfy texture on the outside that keep the inner side of the shoes comfortable and dry. The mesh upper makes sure that the shoe will offer soft snug-fitted texture and keep the foot relaxed during the walk while helping in avoiding pressure on it and slipping issues. The upper of the shoes keep the foot softly fitted for keeping them away from injuries due to twisting. The inner of the shoe is padding with lightweight foam lining and the footbed offers natural foot cradling and support for keeping it easy during the walk. With the help of snug upper and easy footbed, the inner of the shoe allow stability and easy transitioning during the gait so that the foot may not develop pressure on any area. The tongue and collar components in the shoe are padded but not too heavily padded providing a reasonable comfort without creating bulk. The outer sole of the shoe features flexible materials offering flexibility easier transitioning the foot while landing or raised position. It offers an easier and better grip on any surface where you walk. The outsole offers stability and tracking for an anti-slip walk. Due to higher quality, the sole is resistant to wear and tear issues. The shoe fits true to size and you can surely choose the required size without hesitation. For width adjustment, the shoe offers enough room for the bulky feet but if not, you can order wider shoes. The shoe has a sleek design but offers enough room and easy accommodation of the foot to keep it in its natural and comfortable form. The snug fitted upper and lace-up closure make it an effortless shoe that fits the foot without exerting pressure. The sole of the shoe features good grip and make sure to walk safely on the ground with a good and balanced design. The shaft of the shoe is 2.27 inches offering a comfortable posture. Since the shoe is made up of lightweight material and with average padding, it comes in a completely cozy and lightweight structure that would not be a burden for the feet. With a flexible design and lightweight materials, it comes as a perfect sneaker for those who need an easy going shoe for a regular walk. Breathable upper allow consistent air-flow towards the inside of the shoe for keeping it dry and cool while resisting sweating and itching problems. The shoe has been rated 4.4 out of a total of 5 stars making sure that it offers all the best features and confirms to the latest standard for improved performance and comfort needs. The shoe offers a sleek, supportive and snug-fitted design which keep the foot relaxed and safe during the walk, though they may not appear as broad ones but serve good for average sized feet. The Skechers performance Go step shoes are durable and would keep up with your daily walk needs without wear and tear problems. Yes, these shoes are lightweight and offers comfort and impact resistance during the walk. Is there enough padding and arch support in the shoe? The shoe offers a shaft that is 2.75 inches from the arch for a relaxed support but they are not meant for high arches support and have not been designed with heavy padding. But the shoe still offers comfort and support for an easy walk. Are these good for wide feet? For wide feet, you must choose an option with W for catering your increased foot width. The shoe appears to be perfectly fit like a comfortable sneaker for those who need a lightweight, comfortable walking shoe. It comes with a reasonable soft padded insole and sides offering easier walk and comfortable foot cradling without heavy padding. The overall design also provides a sleek finish to make sure the wearer may carry the shoes easily.